WHAT YOU NEED TO KNOW TO STAY OUT OF JAIL! On May 30, 2006, the “Colorado Foreclosure Protection Act” was signed into law creating new restrictions and concerns for investors buying property from a Seller in the foreclosure process. We were able to work with the Colorado Attorney General’s office and the legislature and help draft the new law. There were many people involved in the process including consumer advocate attorneys, real estate attorneys and investor groups such as the National Association of Responsible Home Rebuilders and Investors (NARHI.) Fortunately, we were able to meet directly with the people drafting the language, voice our concerns about the investor community and how it would be affected. No one can really say it is a perfect law, but we were able to make significant changes to what was originally proposed by the drafters of the Act. The first versions mimicked bad laws from other states and truly would have effectively ended foreclosure investing in Colorado. The changes made it a fairly reasonable piece of legislation in comparison. We don’t claim it’s the best piece of legislation out there, but without a doubt, you can still buy foreclosure properties from home owners. The new law does not mean that foreclosure investing is illegal from here on out. The Attorney General’s office and the legislature, at least for now, does not think that just because a homeowner makes a bad deal, they’ve been defrauded. They felt, however, they needed to level the playing field because of a few bad investors taking advantage of people. The new law makes a few bad practices illegal and gives some guidance to legitimate and honest investors. It’s not impossible to follow, but it will mean that investors need to take extra care when they do these deals. Another thing to keep in mind and be happy about is that the legislature gave a few “safe harbors” for investors. What this means is that while for certain things, disclosures are required, the law defined not only the wording but the type size you must use. Why is this good? Well, it’s hard for someone to bring a lawsuit against you for bad disclosure if you gave it exactly as the law requires KEEP IN MIND, and this is important, the language in the statute is for specific required disclosures and contractual provisions. Using this language does not make you immune from every lawsuit. It’s not a perfect law, but they never are. Everyone who is an investor or consultant must be aware that there are Criminal penalties if you don’t follow the law, and if you don’t run your business as set forth in the statute. You may also be liable under the Colorado Consumer Protection Act which gives the Seller the right to sue for triple damages and get their attorney’s fees. This may be worse than jail. Still, if you just follow the requirements of the law, which are fairly reasonable, you can still do well and find good deals. Why Did They Make the Colorado Foreclosure Protection Act? It’s important to reiterate that the law wasn’t created to outlaw foreclosure investing. The proponents of the law just really wanted to stop the bad actors. We talked to both Democrat and Republican legislators and both wanted to keep investors in the foreclosure process. They felt there were people before, and there will always be people, who try to take advantage of people in bad situations, but something had to be done in their mind. Investors would go to someone’s house late at night, convince them to sign over their house, never leave them with copies of the documents and then not fulfill what few promises they made. Truth be told, many of these common practices were never “illegal” but without a doubt, they looked bad and gave a bad name to all foreclosure investors. Sometimes when things look like fraud and smell like fraud, people get concerned, and government attorneys start to investigate. After going after some of the bad investors, the Colorado Attorney General decided it was time to put some requirements into the law to help protect people. Fortunately, they consulted with both the people who felt they were harmed by investors and the people who represent investors. It’s also clear that many of the legislators who worked on this law understood that investors serve a valid purpose and to a certain point, people can make their own bad decisions and face the consequences. Sometimes the government takes a broad brush and outlaws everything. Luckily we were able to make sure the law didn’t go that far. The idea was to create a law that gave some protections to homeowners but let investors keep doing deals. However, AND THIS IS IMPORTANT, if you don’t follow the new law, you can face jail time and fines, so it is not to be taken lightly. It is important to know that the Law originally applied only people in FORECLOSURE. It was later amended to include to homeowners in default. Since a default is not public record until the lender’s default notice (Notice of Election and Demand or “N.E.D.”) is filed with the county Public Trustee, you may have to assume that all people who are selling FSBO are in default and act accordingly! Also, if the person does not live in the home (as of the filing of the N.E.D. ), the deal is not covered by the new law and normal contract and real estate law applies. People who don’t want to buy houses in foreclosure but want to make money giving advice to the owners are now deemed Foreclosure Consultants. Read on and you’ll see that there are a fair number of restrictions on these people and some things to really be concerned with. However, doing this is not illegal. It’s just very important to do it correctly. (IX) Assist the home owner in obtaining from the beneficiary, mortgagee, or grantee of the lien in foreclosure, or from counsel for such beneficiary, mortgagee, or grantee, the remaining or excess proceeds from the foreclosure sale of the residence in foreclosure. First foreclosure consultants can’t obtain any interest in the property, even through a company, association, joint venture or partnership. a. You can stop or delay the foreclosure sale. b. You can get the lender, who has a lien on the property, to stop the sale or collection on the loan. c. You can help the Homeowner cure their default. d. You can get an extension of time to cure the default. e. You can get the lender to waive their right to call the loan due because of the default. f. You can help the Homeowner get any type of loan or advance. This doesn’t even have to be for the house. g. You can save their credit which is getting trashed due to the foreclosure. You don’t obtain any interest in the property, even through a company, association, joint venture or partnership. The way the Law reads, a Foreclosure Consultant, or its affiliate (THINK friend or partner or shill) cannot obtain an interest in the Homeowner’s property or you can go to jail. However, if you do acquire any interest, you’re not a Foreclosure Consultant if you advertised to some person that you could help them in the foreclosure to maybe negotiate with the bank and that’s how you got in the door, be careful about just entering into a purchase agreement. Legally it’s a stretch, but it’s possible that some homeowner will cry foul if they don’t like your deal and complain that you said you would help them in the foreclosure process and then you forced them into a contract.To be safe, it’s probably best to decide ahead of time what you want to do, consult for money or buy the property and stick with that . Is Anyone Exempted from the Foreclosure Consultant Law? 1. Lawyers. They wrote the law so of course they’re exempt. However, if the Lawyer is not representing the Homeowner they are probably not exempt. 2. A lender, or its attorney, who has a lien or deed of trust on the property, but only while they perform services in connection with the lien or deed of trust. 3. Anyone who is operating under the banking, trust, insurance or escrow laws. 4. The person originating or closing a loan if the loan is subject to RESPA or if it’s a second, done in conjunction with a first subject to RESPA. 5. A judgment creditor where the judgment is recorded and the legal action where the judgment came from started before the foreclosure. 6. Title Insurance companies or agents while they are performing services. 7. Licensed real estate agents and brokers so long as they are performing services for which they are licensed. Therefore, if the agent or broker is just trying to be a foreclosure consultant for money, which is not an activity specifically licensed by the Real Estate Commission, they are acting as a foreclosure consultant. If as part of their agent or broker relationship where they’re trying to sell a house for a Homewoner in Foreclosure and they try to help the homeowner get a forebearance, they would be exempt from the act. 8. A non-profit (such as a counseling agency) that only gives advice unless that non-profit is associated with someone who is deemed a foreclosure consultant. The new law makes a lot of requirements about the contract and if you want any chance to enforce one of these contracts and stay out of trouble, you need to follow the law very clearly. While it is a bit onerous, all of these serve to make the contracts clearer and force people to really act in a way that’s pretty far from fraudulent. They also make it easy to make a mistake. If you really want to pursue this, we suggest you retain an attorney to draft a contract for you. 1. The contract must be in writing, in English and translated for the party in whatever language “Principally spoken by the Home Owner.” If it’s translated it needs to be certified by a translator that it is a true and correct copy of the English version which must be given to them as well. So this means that even if they speak perfect English, but they speak another language at home and with all of their friends, family and co-workers, you should get the contract translated just in case. 2. The Home Owner needs to have 24 hours to review it BEFORE they sign it. Remember, if you change any thing in the contract, a date, a price, or even a comma, it would be good practice to give them another 24 hours before they sign. We would also suggest that you have them sign a statement saying they’ve had the contract for 24 hours. 3. You must print the contract in at least twelve point type and include your mailing address. This is easy to do if you write your own contract or you have an electronic form you can check. However, if you just copy a pre printed form from a friend, you better make sure the words are the right size and the sections that need to be in bold are in bold. Investors all too often make the mistake of thinking that any contract that their friend used is fine. Every deal is different and most importantly, you can never be sure if another investor’s contract is good unless you look at it closely or have an attorney review it. 4. You must disclose exactly the services you will provide and what you are getting paid or what your associate might get paid. Be as specific as possible is often saying what you WON’T do in addition to what you will do. This keeps you from being held to do something you never contemplated. Saying what you will do is also important and you want to leave as little to the imagination as possible. Too many people get into contract disputes about what the parties expected. Don’t leave it to later interpretation. 5. You must date the contract and also have every page initialed by each home owner. Make sure you know all the owners. Without the current deed to the property, a title commitment or O and E, you may be breaking the law if only one party signs it. Don’t just rely on the county web site or the foreclosure notice, they can be wrong too. 6. You must have the document notarized IN THE PRESENCE of the home owner. 7. You need to follow exactly the part of the statute that requires disclosures and notices about the right to cancel to the homeowner. This notice is required to be in fourteen point bold type and must be located near the homeowner’s signature block. Click here for a sample disclosure form. 8. You must give a fully signed, dated and acknowledged copy of the contract and the attached notice of cancellation to the Homeowner IMMEDIATELY after it is signed. The Statute allows the Homeowner to cancel the foreclosure consulting contract at any time. Now here’s really why this is a difficult business to be in. If the Homeowner cancels, he or she only has to pay you back the costs you expended. They have sixty days to do this, but you may get nothing for your time unless you sue. You can’t even have a provision in the contract that says there is no cancellation until they pay you back the costs they owe under the statute. A homeowner can cancel the contract by just mailing you any statement that they want to cancel. It doesn’t even have to be the one you attach to the contract. The notice is effective when they put it in the mail so you may not even know the contract was cancelled. What You Can’t Put in the Contract. There are also a few things you can’t put in the contract or do. 1. You can’t have them waive any of their rights defined in the statute. 3. You can’t require them to sue, or sue them in any county other than the one where the property is located. ANY violation of the following is a misdemeanor punishable up to one year in jail and a twenty five thousand dollar fine. 1. YOU CAN’T TRY TO GET SOMEONE TO SIGN A CONTRACT THAT DOES NOT COMPLY WITH EVERY ASPECT OF THE LAW. We put this first because, really, it’s enough to make most people just try a business other than foreclosure consulting. That’s right. If you put a contract in front of someone that does not comply with the law, you face one year in jail, a twenty five thousand dollar fine, or both. 2. You or an associate or even a company you are affiliated with can’t obtain any interest in the Homeowner’s real or personal property. This is just not a deed to their property, it is a contract, a lien, a deed of trust or an ashtray. It’s so broad you can’t even buy something at their garage sale. 3. You can’t impose any costs or fees other than the actual ones. This means you can’t pad the bill or up charge your costs. If the phone call costs you 10 cents, that’s what you pass on. It also probably means you can’t agree what the damages will be, also known as liquidated damages, in the contract. 4. You can’t “Claim, Demand, Charge, Collect or Receive” any payment until after you’ve performed all your services. So no pre-payment for services or even costs if you really want to push it. 5. You can’t make a loan to the homeowner that is more than 2 points above prime, or 8%, whichever is greater. 6. You can’t take security in ANY personal or real property or even a wage to secure your payment. This is so broad it prevents you from even having a friend of the homeowner guarantee your payment and use their property as security. 7. You can’t get paid anything of any value from another person in connection with your services unless you fully disclose it in writing. So if you are a bird dog, you need to say exactly what and why you’re doing what you’re doing. 8. You can’t get a power of attorney from the homeowner for any other reason than to inspect documents. 9. You may not act “unconscionably”. The statute expressly forbids this but strangely does not send you to jail if you do. What does “unconscionable” mean? It’s not very clear but common sense goes a long way here. 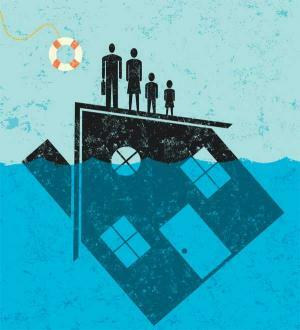 Vis-à-vis the Foreclosure Protection Act, a court has the power to void ANY contract that is unconscionable. For some reason the legislature wanted to reiterate that power and allow the court to void any foreclosure consulting contract they thought was entered into by fraud, lack of choice, unreasonably favorable to the consultant. Are you really still interested in being a “Foreclosure Consultant”? Those are the basics and as an investor you really need to decide whether you’re going to make more money and have less risk buying properties in foreclosure or advising homeowners in foreclosure. If you choose to advise, the best thing to do is have an attorney review your contract and never change that contract unless the law changes. Then again, you could just be an Equity Purchaser, make more money and follow some easier rules. The Colorado legislature really wanted to regulate the purchase of homes from people in foreclosure, not just people who take a fee for “consulting”. Who is an Equity Purchaser? The new law defines an Equity Purchaser as someone who in the course of their business, vocation or occupation (meaning any time you intend to make money) acquires title to the home of someone living in that home as their primary residence which is also in foreclosure. Pretty easy, pretty broad. Who is NOT an Equity Purchaser? 1. People buying for their personal residence to be used for at least one year. 2. Holders of a debt, or their associates, who get a deed in lieu of foreclosure AND the lien (think deed of trust) was recorded before the foreclosure began (which is most likely the filing of the Notice of Election and Demand.). Normally this means banks. However, an investor could buy a bank debt and then negotiate a deed in lieu deal with the owner. 3. People who acquire the public trustee or sheriff’s deed after the sale. 4. People who acquire the deed at any sale authorized by statute. This would mean those people who go to the foreclosure sale and bid. 5. If a court transfers the ownership to you. This would mean because of a lawsuit, or a bankruptcy or even a settlement enforced by the Court. The real thing to keep in mind is that if the court transfers the property to you, you don’t have to worry about the contracts with the Owner. 6. If you get the deed from your spouse, close relative, guardian, conservator or personal representative. 7. If you obtain the property while performing normal business activities, duties or services under any banking, trust, insurance, title or escrow regulation. Every contract between an Equity Purchaser and a Homeowner needs to contain certain thing to make it valid. The contract survives the transfer of the property to you, which means that if you didn’t do something you said you would, they can still sue you even if they signed over the deed. The contract must be in writing, in English or translated for the party in whatever language “Principally spoken by the Home Owner.” If it’s translated it needs to be certified by a translator that the translation is a true and correct copy of the English version which must be given to them as well. So this means that even if they speak perfect English but they speak another language at home most of the time, you probably need to get the contract translated. Here’s what you need as a minimum for your equity purchase contract to be valid. 1. It has to be in writing with twelve point Bold faced type. 2. The contract has to be fully completed, signed and dated by every person that owns the home and the equity purchaser BEFORE you execute and instrument (usually a deed) which transfers the interest. This also applies to any deal involving a situation where the homeowner gives you any lien or deed of trust. 3. The written contract has to contain all points of the deal, nothing can be oral or in some other document. The contract has to contain at the VERY LEAST, the following. a. The name, business address and phone number of the Equity purchaser. b. The street address and the full legal description of the residence in foreclosure. WARNING: PURCHASER,_______________________(insert investor’s name _______________________ , WILL NOT ASSUME OR PAY ANY PRESENT MORTGAGE, DEEDS OF TRUST, OR OTHER LIENS OR ENCUMBRANCES AGAINST THE PROPERTY. THE SELLER, , UNDERSTANDS HE/SHE WILL REMAIN RESPONSIBLE FOR ALL PAYMENTS DUE ON SUCH MORTGAGES, DEEDS OF TRUST, OR OTHER LIENS OR ENCUMBRANCES AND FOR ANY DEFICIENCY JUDGMENT UPON FORECLOSURE. I HAVE HAD THE FOREGOING READ TO ME AND UNDERSTAND THE PURCHASER, , WILL NOT ASSUME ANY PRESENT MORTGAGES, DEEDS OF TRUST, OR OTHER LIENS OR ENCUMBRANCES AGAINST THE PROPERTY DESCRIBED AS_____________________________. d. The total amount your are going to pay “in connection with or incident” to your purchase. This means if you’re giving any money or any property or even a can of soup to the seller or to anyone else, you need to disclose it in the contract. Don’t just disclose the dollars you’re paying for the property. e. The terms of payment, or, if as part of the deal you are doing anything else for the homeowner, before or after the sale, such as moving them out, paying their electric bill or mowing the lawn, you need to disclose that as well. f. The date and time you are transferring ownership. So you can’t just put a day in, you need to give a time as well. g. The terms of any rental agreement or lease. The law doesn’t specify what this means, so to be safe, you need to specify any current lease or any lease you may offer to anyone including the homeowner. h. The specifics of any option or right to repurchase including the amount of escrow, deposit, down payment, the purchase price, the closing costs, commissions and any other fee or cost. We’ll talk more about this later. i. The following notice in Fourteen Point Bold Faced Type and completed with your name. This must be right before the Notice of Cancellation which has to come right before the signatures. CANNOT ask you to sign or have you sign any deed or any other document. The statute was recently amended to exclude the equity purchase contract requirements when a state-approved “short sale addendum” is used for the purpose of negotiating a short sale on a deal. However, the state ALSO put a cute little provision that requires FULL disclosure to the lender if you resell the property you are shorting within 14 days of closing. This will effectively kill all “double closings” on short sales. The only option really is to purchase for cash, wait 14 days, then resell. You may cancel this contract for the sale of your house without any penalty or obligation at any time before _______________________(Date and time of day). See the attached notice of cancellation form for an explanation of this right. Now, you need to know that this statement is in addition to the cancellation form you attach to the contract and any other right they may have to cancel. So if they could cancel the contract because of fraud, bad signatures, incorrect names etc., they still can even after the time in the notice. Of course, they could have done that without the new law. The cancellation is good when they deliver it or just put it in the mail. YOU DON’T HAVE TO RECEIVE THE MAIL FOR THE CANCELLATION TO BE GOOD. So it might be a good idea to hold off until the end of their cancellation period and then see if they have or get them to sign something that says they have not, which is not a perfect solution. Whenever you are trying to count the days or get to day “x” you start with the date the seller gets the contract as day 1 and count 3 business days. You start the count and if you come to a day which is a weekend or holiday, you pick up the count from the next day that is not. For instance, if you give the contract to the seller on a Thursday, you count Thursday to Friday as one day Friday to Monday as the second day and Monday to Tuesday as the Third day. You need to attach to the contract duplicate forms that have the actual “Notice of Cancellation” on it. These need to be detachable so the seller can sign it and send it to you if they cancel. The statute at one point says “twelve point” bold and then in another “ten point”; so to be safe, make sure its in all caps, twelve point bold face type and says the following. Always give a copy of the entire signed contract to the Seller IN THEIR NATIVE LANGUAGE AND IN ENGLISH. Make sure you filled in every blank correctly. Read it over to yourself out loud and make sure you have the names in the right place, the dates and times filled out and any numbers you need put in. IF YOU DON’T FILL IT OUT CORRECTLY, THE SELLER CAN ALWAYS CANCEL THE CONTRACT AT ANY TIME!